I don’t think many of us eat bitter melons regularly, the way we do spinach or lettuce. Two possible reasons explain this lack of popularity: it isn’t sold in supermarkets (you’d have to buy them from an ethnic store) and the sharp bitter taste can leave people gagging (that might be an exaggeration though; "scowling" might be more appropriate). Let’s not, however, dismiss it just yet from our North American diet. 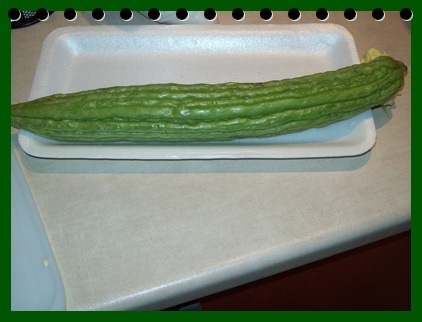 It is a vegetable that has promising health benefits; otherwise, why would the National Bitter Melon Council be formed to promote it (http://bittermelon.org/heal/bittermelonanddiabetes)? The Council speaks of bitter melon as beneficial for diabetes and HIV patients. Regarding diabetes, the Council says "studies suggest that bitter melon may play a role in controlling the production of insulin by the body, thus promoting blood sugar control. The hypoglycemic effect is more pronounced in the fruit of Bitter Melon where these chemicals are found in the highest quantity. 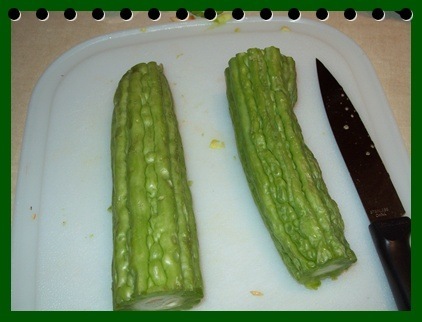 Some of the documented studies show this bitter gourd to enhance cells’ uptake of glucose, to promote insulin release, and to make the effect of insulin more potent. Some even document Bitter Melon’s effect on total cholesterol reduction." It didn’t say what studies these were, but they’re not the only ones who say so. People I meet in Asian stores who fill their carts with this vegetable say "I have diabetes so I try to eat this often." Studies of bitter melon and HIV appear to have more evidence. 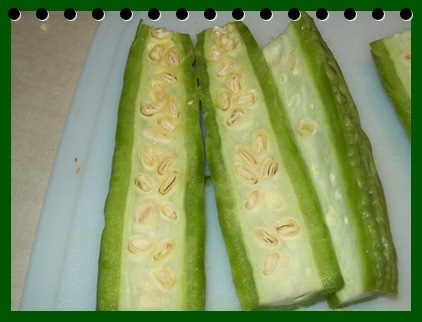 "In one study done in Los Angeles in 1992, as many as 100 persons with AIDS or HIV tried using Bitter Melon as a possible herbal AIDS treatment. Interest in Bitter Melon for HIV began when academic researchers found two proteins in Bitter Melon which inhibited HIV in lab tests: MAP 30 and momorcharain." The National Bitter Melon Council does a good job of promoting bitter melon because the web site holds credibility. I believe it is run by four people who are active in social and community development, sharing their ideas on healthy neighborhoods. Many Asians don’t need to be persuaded to eat it, but I’m delighted that this lowly vegetable has the potential of going from lowly to "spotlight." 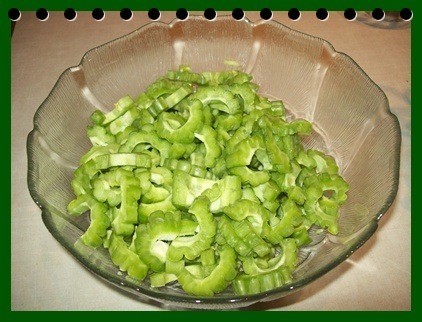 There are many recipes for bitter melon. I cook it the way I learned it back home. It’s a very easy recipe needing only garlic, onions, tomatoes, a beef or chicken bullion cube, and an egg which is added into the pan a few minutes before serving. The egg is scrambled into the mixture. 1. When you’re ready to cook it, slice it lengthwise as in the picture below. 3. 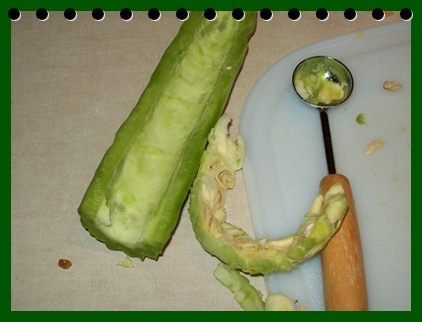 Scoop out the seeds and flesh, using either a melon scooper or a knife. 4. 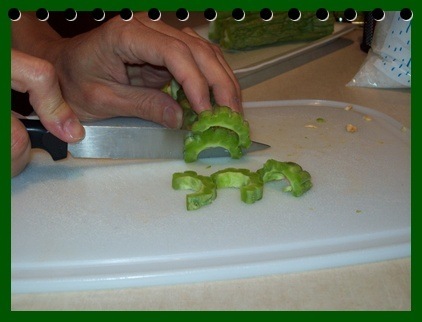 When the seeds and flesh have been removed, slice them thinly (about 2-3 cm) beginning at the tip. 5. When you’re done slicing, rub them with salt (this is to remove some of the bitter taste – note I said "some"). Set aside for 10-15 minutes. Rinse thoroughly with cold running water. At this point, your bitter melon is ready to cook. For my recipe, I’d be happy to send it to you if you leave me your name and email. If you want to search for recipes on your own, please do – you’ll find a few versions on youtube and on other web sites.